After New York City was ravaged by Hurricane Sandy in 2012, there was an understanding that the city had to increase its resiliency in the process of rebuilding. In other words, it wasn’t good enough to just repair the damage—systems had to be put in place that could protect the city against something like this happening again. Like, for example, by using parks. This idea is found in a project called The Big U, which is one proposal unveiled this past week as part of the Rebuild By Design competition that sought ideas to build this new resilience infrastructure. 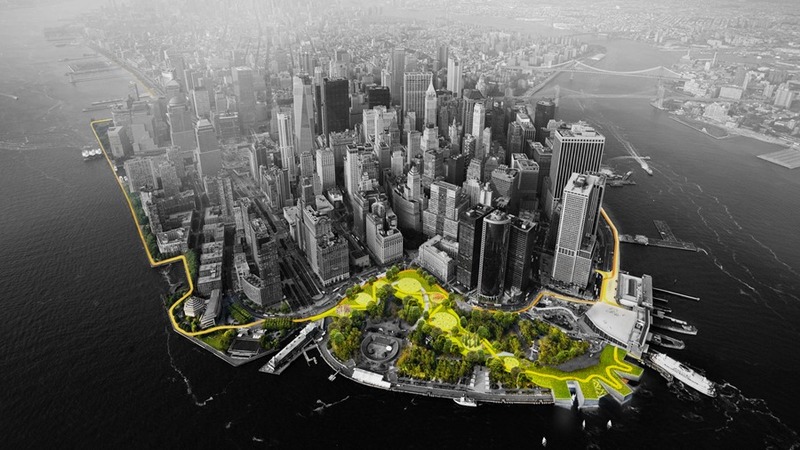 The Big U calls, in part, for a park-topped flood protection berm that would wrap around certain sections of lower Manhattan. Using salt-resistant plants and landscape features, it would protect against and manage flooding while at the same time creating a space that doesn’t cut people off, but welcomes them instead. Waterfront areas are great, but they are also risky, especially in a world whose weather is becoming more volatile from climate change. Using green infrastructure solutions to build resilience into waterfront areas helps protect the value and livability of these areas. And it does so without building big sea walls and other nasty things that actually sever people from the very reason they are by the waterfront at all. Toronto already has a smaller scale, but still impressive version of this kind of infrastructure in one of its newest parks, Corktown Common (formally Don River Park). The park does double-duty as a flood protection berm that guards the areas to its west—an estimated 210 hectares, including the city’s financial district—from any swelling and bursting of the Don River to its east. And the park, designed by Michael van Valkenburgh (of Brookyn Bridge Park-fame), is stunningly beautiful as well. So Toronto gets a piece of important infrastructure, which unlocks the value of the adjacent lands for development, hidden inside a park that is now one of the city’s new green gems. Not a bad deal. I’m so excited to see that Open Streets Toronto, which proposes opening up a stretch of Bloor Street for four Sundays this summer to people rather than cars between High Park and Withrow Park, is gaining momentum. We don’t often think of them this way, what with all the vehicles rumbling along them 24/7, but the streets of our cities are our largest public spaces. In Toronto, for example, there are 5,617 kilometres of roadways comprising 27.4 percent of the city’s area. To put that in perspective, parks and open spaces cover just about 13 percent of Toronto. So it’s not surprising that in dense cities where new land for parks is difficult to come by, people are looking at streets that can be permanently or temporarily opened up to people to create new open spaces and pop-up parks. These not only get people outside, they allow people to experience their city in new ways and help connect neighbourhoods. There is probably a health argument here somewhere, but forget about that eat-your-greens stuff for a moment. What about a fun argument? Shouldn’t we be allowed to play in the street for four Sundays in the summer? No, say some people. Streets are for cars, trucks and busses. It will cause gridlock, chaos, anarchy. 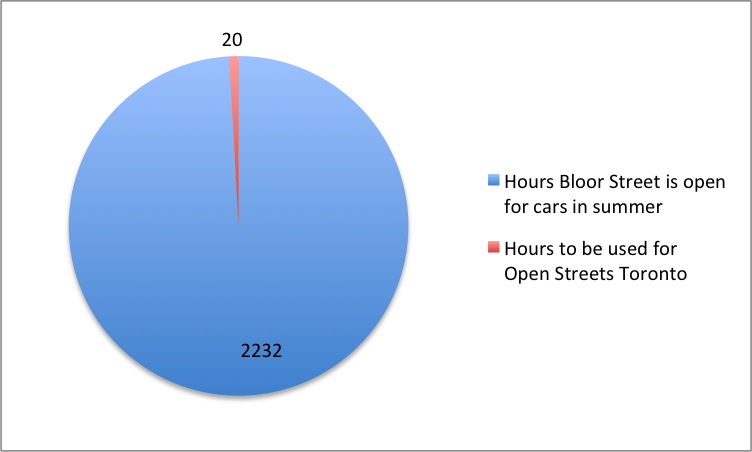 There are 2,232 hours in summer where Bloor Street is open for cars (okay, okay there are some other smaller street closures for festivals, I’m spit-balling here). Open Streets Toronto is proposing to use 20 of those hours (five hours on four different Sundays) for people only. That’s a pretty small percentage of hours that cars won’t be able to travel east-west this summer. 0.0089 percent to be exact. 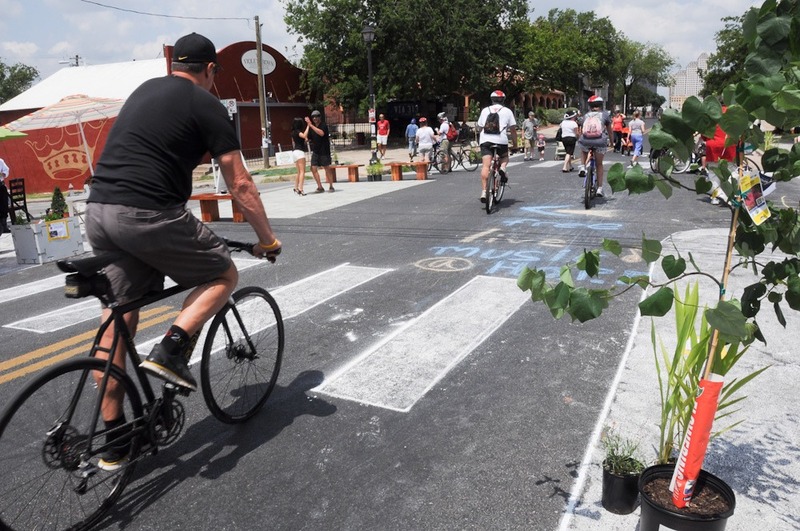 North American cities from Austin to New York City to Vancouver have already experimented with opening up stretches of roadway in the summer in similar programs to Open Streets Toronto. So far their economies are doing okay, fingers-crossed. I was in New York City a few summers ago and stumbled upon Summer Streets, which opened up portions of roadway in Manhattan to people. I borrowed a free bike and zoomed up towards Central Park with thousands of others. I passed people doing yoga, taking dance lessons, or just walking around. Everyone was giddy about the fact that they were in the middle of Park Avenue. For a few hours on a sunny summer day, the street lived up to its name.